If you’ve played a Yakuza game in the last few years, you know what you’re getting into with Judgment. You’re again in Kamurocho. You’re close to yakuza-related drama, but not that close. When you meet characters, they’re often introduced with a dramatic title card, only now it’s in a laid back serif font rather than the loud etching of the Yakuza games. 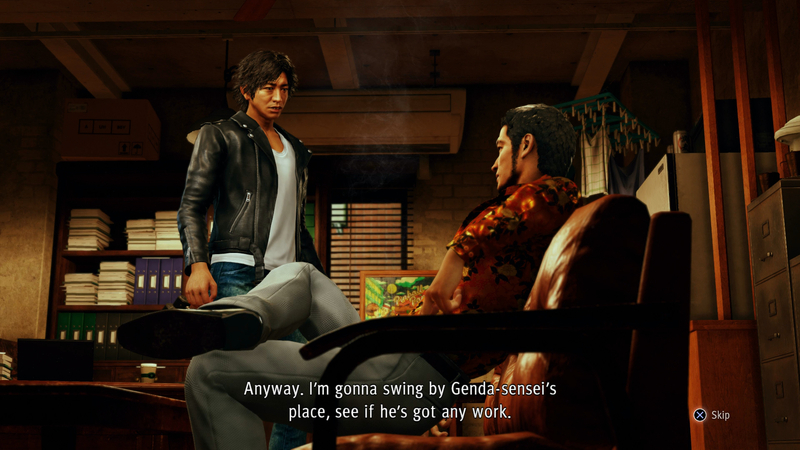 But contrary to all its similarities, Judgment is not a Yakuza game in the traditional sense, even if it is set in the Yakuza-verse. Earlier in February, I played two hours of the newly localized version of Judgment, which is set to release this summer. Much like Fist of the North Star: Lost Paradise, it features full english voiceover, which sets it apart from the mainline Yakuza games. Greg Chun voices the lead character; in Japanese, famous actor Takuya Kimura voices the role, and shares his likeness. Like the Japanese dramas and action movies Kimura stars in, Judgment is a detective thriller with overdramatic flair. I played through the opening couple of hours, a Sega representative skipping us over the prologue to make things breezier. The dub, from what I played, seemed solid. Both the English dub and subtitled version with Japanese audio have different scripts; the sub localized to fit the Japanese script, the English script localized more to fit its English voice acting. About halfway through the demo, I opted to switch to Japanese voiceover, and with a save and then exit to the menu, we switched languages easily. Walking around, the first thing I noticed were little bubbles floating around NPCs’ heads. Sometimes they said what read like text messages, similar to past games’ version of this with bits of conversations, other times it was pictures. A Sega representative told me that it’s basically other peoples’ tweets, which sometimes give you hints of places to go. Fake social media accounts has become bizarrely prevalent in modern triple-A games, but it’s funny almost every time. As for Judgment itself, there are some new twists on the Yakuza formula. You play as private detective Takayuki Yagami, a former lawyer. After a client he successfully got acquitted for murder actually murders his girlfriend upon returning home, he leaves the law firm. This leads to him growing out his hair and getting really into leather jackets and tight jeans, as a private detective should. His partner at the agency is an ex-Yakuza from the Tojo Clan, who seems like a very nice guy. (Sound familiar?) As a detective, you take on cases big and small, with the main story to last an average of 30 hours, comparable to the Yakuza experience. Tonally, it’s like a cornier Yakuza, perhaps emblematic of the J-Dramas it’s inspired by. The story is self-serious (and violent too), with a serial killer mystery at its core. In Kamurocho, you’re on a twisty case solving the deaths of multiple yakuza from Kansai, who have turned up with their eyes carved out. The darker premise is contrasted by the silly side content that has become a Yakuza staple, showing us that not everything in this private detective’s life is saturated with doom and gloom. I wandered around Kamurocho a lot, finding it both familiar yet new with its modern setting in late 2018. In Yakuza 6, the same neighborhood was sadly limited, with construction gating a lot of access and the town of Onomichi being more the center of its story. In Judgment, the neighborhood is all open, and the city has changed from what we remember it. Judgment brings back all the trappings of our favorite Yakuza games with silly but endearing substories, arcade games like Puyo Puyo (from its Puyo Puyo Tetris iteration), Fantasy Zone, Virtua Fighter 5, and more. The cat cafe, though I did not see it with my own eyes, allegedly returns. Replacing the Cabaret Club ongoing minigame is a new crowdfunding venture, which is a riff on Kickstarter. A new side activity includes drone racing, which also come into play in investigations in utilizing your drone. Sadly, karaoke will be sitting this game out. The investigations is where the Yakuza formula is the most shaken up. As a detective, you’re tasked with tailing people, investigating scenes in first person to maybe spot a hidden camera or even identify a suspect based on a description (you can also find stray cats in these segments), and can even make dialogue choices during interrogations. While a Sega rep confirmed that Judgment will be linear in terms of its story, choosing the correct dialogue options in a row to press a suspect will grant you an SP boost (experience used to unlock passive, active, and combat abilities). Other changes include room decoration, where now the items you get from gacha machines and beyond you can place in your office (where you also live). The more you buy from shops like Don Quijote as well will net you vinyl records that you’ll be able to play in your office. Walking around Kamurocho too, you’re once again outfitted with a handy camera phone. 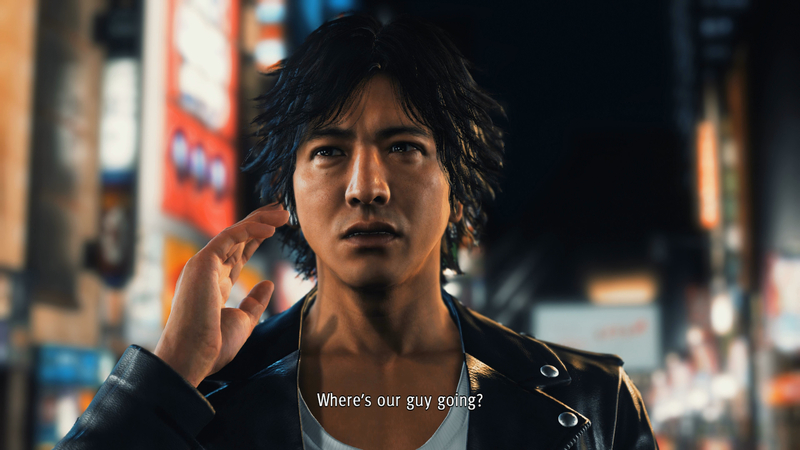 A Sega rep tells me it’s been tweaked for Judgment, playing into the celebrity persona of its lead actor. Additional filters will be unlockable as well. Perhaps it’s like Rust Cohle on True Detective said, quoting a concept from philosopher Friedrich Nietzsche, « Time is a flat circle. Everything we’ve ever done, or will do, we’re gonna do over and over and over again. » The Ryu ga Gotoku Studio at Sega will continue making Yakuza games, even without Yakuza in the name or a familiar face at the center. And fans will continue to love them. Luckily even with so much of Judgment feeling like deja vu—the alleys of Kamurocho, picking up bikes to beat people up in the streets, the Sega games burrowed in arcades—for me, there’s enough that’s fresh to keep it from feeling like a bad thing. When I wrapped my Judgment demo, I was a little bummed because I wanted to keep playing, which is a rare thing for me in previews. The first thing I did was message my co-worker Mike Williams on Slack, a fellow believer in all things Yakuza. « Get hyped for Yakuza-L.A. Noire, » I said. He was already down. If you’re down too, we don’t have to wait long, as it’s expected for release this summer on PlayStation 4.